Gospel Notes is a free laity educational offering of Steadfast in the Parish for use within Lutheran churches. Pastors are encouraged to share, download, print, and use these publications within their congregations. Click here for more information about Gospel Notes. 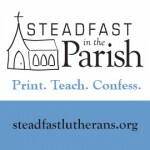 These resources will be available roughly a week and a half before the Sunday in question, allowing inclusion in parish bulletins or use by laity for family preparation before each Sunday. The standard version can be printed double-sided on a 8½ x 11″ sheet, and possibly folded as well for distribution through bulletins, or put on the narthex table for distribution. The bi-fold version is a “booklet form” that folds and inserts nicely inside a standard bulletin. The legal half-page is designed for those parishes who already have the readings from CPH in their bulletins, this lets you print these notes on a legal (8½ x 14″) sheet, cut it in half, and insert it in your bulletins. It removes the left column from the other formats, and makes it so one double-sided half-sheet can be inserted. Advent 1 — Ad Te Levavi Online or PDF’s: Color, B/W, Bi-folds: Color, B/W, or Half-Page Legal Color, B/W. Advent 2 — Populus Zion Online or PDF’s: Color, B/W, Bi-folds: Color, B/W, or Half-Page Legal Color, B/W. Advent 3 — Gaudete Online or PDF’s: Color, B/W, Bi-folds: Color, B/W, or Half-Page Legal Color, B/W. Advent 4 — Rorate Coeli Online or PDF’s: Color, B/W, Bi-folds: Color, B/W, or Half-Page Legal Color, B/W. Advent 4 — Rorate Coeli Alternate Reading (Luke 1:39-56) Online or PDF’s: Color, B/W, Bi-folds: Color, B/W, or Half-Page Legal Color, B/W. Christmas Eve Online or PDF’s: Color, B/W, Bi-folds: Color, B/W, or Half-Page Legal Color, B/W. Christmas Midnight/Dawn Online or PDF’s: Color, B/W, Bi-folds: Color, B/W, or Half-Page Legal Color, B/W. Christmas Day Online or PDF’s: Color, B/W, Bi-folds: Color, B/W, or Half-Page Legal Color, B/W. First Sunday after Christmas Online or PDF’s: Color, B/W, Bi-folds: Color, B/W, or Half-Page Legal Color, B/W. Second Sunday after Christmas Online or PDF’s: Color, B/W, Bi-folds: Color, B/W, or Half-Page Legal Color, B/W. Eve of the Circumcision Online or PDF’s: Color, B/W, Bi-folds: Color, B/W, or Half-Page Legal Color, B/W. Circumcision of our Lord Online or PDF’s: Color, B/W, Bi-folds: Color, B/W, or Half-Page Legal Color, B/W. Epiphany Online or PDF’s: Color, B/W, Bi-folds: Color, B/W, or Half-Page Legal Color, B/W. Baptism of Our Lord Online or PDF’s: Full Page, Bi-fold, Half-Page Legal. First Sunday after Epiphany Online or PDF’s: Color, B/W, Bi-folds: Color, B/W, or Half-Page Legal Color, B/W. Second Sunday after Epiphany Online or PDF’s: Color, B/W, Bi-folds: Color, B/W, or Half-Page Legal Color, B/W. Third Sunday after Epiphany Online or PDF’s: Color, B/W, Bi-folds: Color, B/W, or Half-Page Legal Color, B/W. Fourth Sunday after Epiphany Online or PDF’s: Color, B/W, Bi-folds: Color, B/W, or Half-Page Legal Color, B/W. The Transfiguration of Our Lord Online or PDF’s: Full Page, Bi-fold, Half-Page Legal. Fifth Sunday after Epiphany Online or PDF’s: Color, B/W, Bi-folds: Color, B/W, or Half-Page Legal Color, B/W. Septuagesima Online or PDF’s: Color, B/W, Bi-folds: Color, B/W, or Half-Page Legal Color, B/W. Sexagesima Online or PDF’s: Color, B/W, Bi-folds: Color, or B/W, or Half-Page Legal Color, B/W. Quinquagesima Online or PDF’s: Color, B/W, Bi-folds: Color, or B/W, or Half-Page Legal Color, B/W. Ash Wednesday Online or PDF’s: Color, Bi-Fold, or Half-Page Legal PDF. Lent 1 — Invocabit Online or PDF’s: Color, B/W, Bi-folds: Color, B/W, or Half-Page Legal Color, B/W. Lent 2 — Reminiscere Online or PDF’s: Color, B/W, Bi-folds: Color, B/W, or Half-Page Legal Color, B/W. Lent 3 — Oculi Online or PDF’s: Color, B/W, Bi-folds: Color, B/W, or Half-Page Legal Color, B/W. Lent 4 — Laetare Online or PDF’s: Color, B/W, Bi-folds: Color, B/W, or Half-Page Legal Color, B/W. Lent 5 — Judica Online or PDF’s: Color, B/W, Bi-folds: Color, B/W, or Half-Page Legal Color, B/W. Lent 6 — Palmarum Online or PDF’s: Color, B/W, Bi-folds: Color, B/W, or Half-Page Legal Color, B/W. Lent 6 — Palmarum Alternate Reading (John 12:12-19) Online or PDF’s: Color, B/W, Bi-folds: Color, B/W, or Half-Page Legal Color, B/W. Holy Monday: Color PDF, the Black and White PDF, the Bi-Fold Color PDF, the Bi-Fold Black and White PDF, the Legal Half-Page PDF, or the Legal Black and White PDF. Holy Tuesday: Because of the length of today’s reading, it takes multiple pages. Therefore a special bifold one is available for 11×17 to fit onto one page: Color PDF, the Black and White PDF, the 11×17 Color PDF, the Black and White PDF, the Bi-Fold Color PDF, the Bi-Fold Black and White PDF, the Legal Half-Page PDF, or the Legal Black and White PDF. Holy Wednesday: Color PDF, the Black and White PDF, the Bi-Fold Color PDF, the Bi-Fold Black and White PDF, the Legal Half-Page PDF, or the Legal Black and White PDF. Maundy Thursday: Color PDF, the Black and White PDF, the Bi-Fold Color PDF, the Bi-Fold Black and White PDF, the Legal Half-Page PDF, or the Legal Black and White PDF. Holy Saturday: Color PDF, the Black and White PDF, the Bi-Fold Color PDF, the Bi-Fold Black and White PDF, the Legal Half-Page PDF, or the Legal Black and White PDF. Easter Sunrise — You may download the Color PDF, the Black and White PDF, the Bi-Fold Color PDF, the Bi-Fold Black and White PDF, the Legal Half-Page PDF, or the Legal Black and White PDF. Easter — Online or PDF’s: Color, B/W, Bi-folds: Color, B/W, or Half-Page Legal Color, B/W. Easter 2 — Quasimodo Geniti Online or PDF’s: Color, B/W, Bi-folds: Color, B/W, or Half-Page Legal Color, B/W. Easter 3 — Misericordias Domini Online or PDF’s: Color, B/W, Bi-folds: Color, B/W, or Half Legal Color, B/W. Easter 4 — Jubilate Online or PDF’s: Color, B/W, Bi-folds: Color, B/W, or Half-Page Legal Color, B/W. Easter 5 — Cantate Online or PDF’s: Color, B/W, Bi-folds: Color, B/W, or Half-Page Legal Color, B/W. Easter 6 — Rogate Online or PDF’s: Color, B/W, Bi-folds: Color, B/W, or Half-Page Legal Color, B/W. Ascension of our Lord Online or PDF’s: Color, B/W, Bi-folds: Color, B/W, or Half-Page Legal Color, B/W. Easter 7 — Exaudi Online or PDF’s: Color, B/W, Bi-folds: Color, B/W, or Half-Page Legal Color, B/W. Pentecost — Whitsunday Online or PDF’s: Color, B/W, Bi-folds: Color, B/W, or Half-Page Legal Color, B/W. Holy Trinity Sunday Online or PDF’s: Color, B/W, Bi-folds: Color, B/W, or Half-Page Legal Color, B/W. First Sunday after Trinity Online or PDF’s: Color, B/W, Bi-folds: Color, B/W, or Half-Page Legal Color, B/W. Second Sunday after Trinity Online or PDF’s: Color, B/W, Bi-folds: Color, B/W, or Half-Page Legal Color, B/W. Third Sunday after Trinity Online or PDF’s: Color, B/W, Bi-folds: Color, B/W, or Half-Page Legal Color, B/W. Fourth Sunday after Trinity Online or PDF’s: Color, B/W, Bi-folds: Color, B/W, or Half-Page Legal Color, B/W. Fifth Sunday after Trinity Online or PDF’s: Color, B/W, Bi-folds: Color, B/W, or Half-Page Legal Color, B/W. Sixth Sunday after Trinity Online or PDF’s: Color, B/W, Bi-folds: Color, B/W, or Half-Page Legal Color, B/W. Seventh Sunday after Trinity Online or PDF’s: Color, B/W, Bi-folds: Color, B/W, or Half-Page Legal Color, B/W. Eighth Sunday after Trinity Online or PDF’s: Color, B/W, Bi-folds: Color, B/W, or Half-Page Legal Color, B/W. Ninth Sunday after Trinity Online or PDF’s: Color, B/W, Bi-folds: Color, B/W, or Half-Page Legal Color, B/W. Tenth Sunday after Trinity Online or PDF’s: Color, B/W, Bi-folds: Color, B/W, or Half-Page Legal Color, B/W. Eleventh Sunday after Trinity Online or PDF’s: Color, B/W, Bi-folds: Color, B/W, or Half-Page Legal Color, B/W. Twelfth Sunday after Trinity Online or PDF’s: Color, B/W, Bi-folds: Color, B/W, or Half-Page Legal Color, B/W. Thirteenth Sunday after Trinity Online or PDF’s: Color, B/W, Bi-folds: Color, B/W, or Half-Page Legal Color, B/W. Fourteenth Sunday after Trinity Online or PDF’s: Color, B/W, Bi-folds: Color, B/W, or Half-Page Legal Color, B/W. Fifteenth Sunday after Trinity Online or PDF’s: Color, B/W, Bi-folds: Color, B/W, or Half-Page Legal Color, B/W. Sixteenth Sunday after Trinity Online or PDF’s: Color, B/W, Bi-folds: Color, B/W, or Half-Page Legal Color, B/W. Eighteenth Sunday after Trinity Online or PDF’s: Color, B/W, Bi-folds: Color, B/W, or Half-Page Legal Color, B/W. Nineteenth Sunday after Trinity Online or PDF’s: Color, B/W, Bi-folds: Color, B/W, or Half-Page Legal Color, B/W. Twentieth Sunday after Trinity Online or PDF’s: Color, B/W, Bi-folds: Color, B/W, or Half-Page Legal Color, B/W. 21st Sunday after Trinity Online or PDF’s: Color, B/W, Bi-folds: Color, B/W, or Half-Page Legal Color, B/W. 22nd Sunday after Trinity Online or PDF’s: Color, B/W, Bi-folds: Color, B/W, or Half-Page Legal Color, B/W. 23nd Sunday after Trinity Online or PDF’s: Color, B/W, Bi-folds: Color, B/W, or Half-Page Legal Color, B/W. 24th Sunday after Trinity Online or PDF’s: Color, B/W, Bi-folds: Color, B/W, or Half-Page Legal Color, B/W. 25th Sunday after Trinity PDF’s: Color, B/W, Bi-folds: Color, B/W, or Half-Page Legal Color, B/W. 26th Sunday after Trinity PDF’s: Color, B/W, Bi-folds: Color, B/W, or Half-Page Legal Color, B/W. Last Sunday of the Church Year Online or PDF’s: Color, B/W, Bi-folds: Color, B/W, or Half-Page Legal Color, B/W. The Purification of Mary Online or PDF’s: Color, B/W, Bi-folds: Color, B/W, or Half-Page Legal Color, B/W. Thanksgiving Online or PDF’s: Color, B/W, Bi-folds: Color, B/W, or Half-Page Legal Color, B/W. The Reformation Online or PDF’s: Color, B/W, Bi-folds: Color, B/W, or Half-Page Legal Color, B/W. All Saints Online or PDF’s: Color, B/W, Bi-folds: Color, B/W, or Half-Page Legal Color, B/W. 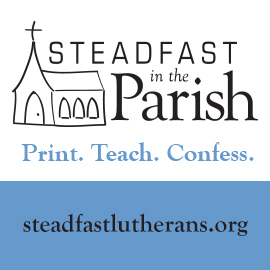 Click here for other resources from Steadfast in the Parish. Use the form below to sign up to receive these posts by email (or sign up by clicking here). Archives can be found here.